North Texas Kids Magazine is giving away multiple family four-packs of tickets to the special advance screening of Jem and the Holograms. That means you get to see this new release before it officially starts in the theaters! Watch the trailer and then enter the giveaway below. Ends Friday, October 16th. Contest ends on Friday, October 16th. Winners will be notified by email (the one you use to leave the comment below) and must respond ASAP! A limited number of entries will be selected via random drawing and awarded a family four-pack of passes (4 seats). One entry per family please. ABOUT THE FILM: As a small-town girl catapults from underground video sensation to global superstar, she and her three sisters begin a one-in-a-million journey of discovering that some talents are too special to keep hidden. 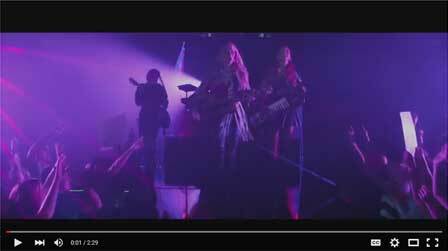 In Universal Pictures’ Jem and the Holograms, four aspiring musicians will take the world by storm when they see that the key to creating your own destiny lies in finding your own voice. Directed by Jon M. Chu (Step Up series, G.I. Joe: Retaliation), the musical adventure stars Aubrey Peeples, Stefanie Scott, Aurora Perrineau, Hayley Kiyoko, Ryan Guzman, Molly Ringwald and Juliette Lewis. 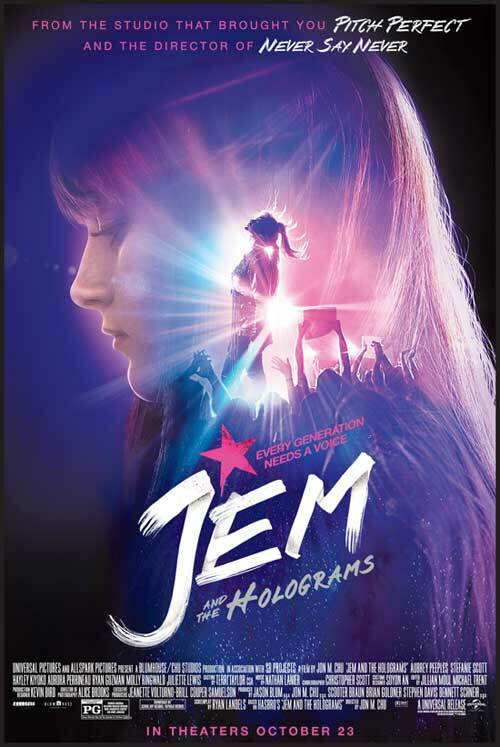 Jem and the Holograms, based on the iconic Hasbro animated TV series, is written by Ryan Landels and produced by Chu, Jason Blum for Blumhouse Productions, Scooter Braun for SB Projects, Bennett Schneir, and Brian Goldner and Stephen Davis of Hasbro Studios. my daughter will love to win these tickets to go with her friends. As a child of the 80s I can’t WAIT to see this and my 11 yr old daughter wants to see it as well! !